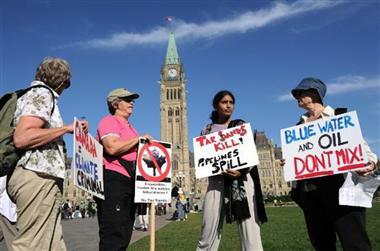 The CBC has coverage of the arrests at the Keystone XL protests in Ottawa here. This entry was posted in Canada, Current Events on September 28, 2011 by Michael Happy. There is a huge number of Americans who simply don’t realize that they’ve been victimized by Wall Street – that they’ve paid inflated commodity prices due to irresponsible speculation and manipulation, seen their home values depressed thanks to corruption in the mortgage markets, subsidized banker bonuses with their tax dollars and/or been forced to pay usurious interest rates for consumer credit, among other things. I would imagine the end game of any movement against Wall Street corruption is going to involve some very elaborate organization. There are going to have to be consumer and investor boycotts, shareholder revolts, criminal prosecutions, new laws passed, and other moves. But a good first step is making people aware of the battle lines. This entry was posted in Current Events, Quote of the Day on September 28, 2011 by Michael Happy.